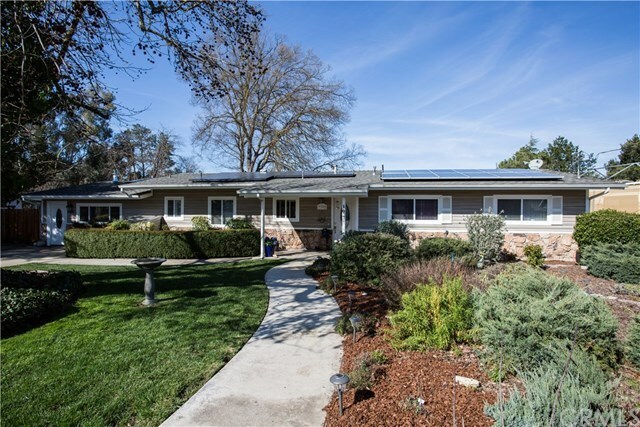 This gorgeous mid-century rambler has all the features and amenities which rarely are seen on the market in this location! A main home of 1,760+/- sq ft with 4 generous bedrooms, 2 bathrooms, larger living and formal dining and a game area with built in hutch. Master suite has large custom bathroom and own exit to the the incredible back yard! Attached with its own entrance as well as access door from the main home is a fully functional studio apartment with own kitchen, bathroom, bedroom, office and living area at 850+/- Sq Ft. Detached from the home is a 320 sq ft workshop resting over the back half of this nearly 3/4 acre parcel. There is TESLA solar installed with the home 3 years ago as well as tons of driveway space and long drive for RV! Skylights within the home add just the right amount of light throughout the day and towering shade trees provide afternoon shade. All of this and STILL room for animals, garage/workshop extension and play areas! Directions: San Anselmo Exit, head West to Monterey. Right on Monterey Rd and Ramona will be down 1-2 Mile. Right on Ramona home to LHS. Inclusions: Nook dining ensemble, possibly some furniture if desired. Seller downsizing.